Kyle Kesler Cut His Body Fat By 14.5% By Cutting Fat And Building Lean Muscle! Kyle felt like he wasn't getting anywhere in the gym so he decided to do a little research and it paid off. Read on to see how Kyle turned education into rsults! In the spring of 2009 I had just got out of college for the summer and was working on a farm. I had access to a little home gym so I decided I was going to start working out. I looked in the mirror and just wasn&apos;t happy with the person that I saw. I lifted a little and ran but really had no idea what I was doing. I thought I was getting stronger and getting in better shape but the real wakeup call came for me at the end of the summer. This is what really got me going. I went to the Idaho state fair with my girlfriend and her family. As we walked around looking at the little displays and vendors we came to the booth that was put on by the U.S. Marines. They had a pull up bar and were giving away things if you could do certain numbers of pull-ups. Thinking I was in really good shape I jumped up and kicked, forced and strained out 12 pullups which was all I could do. Feeling pretty good about myself I jumped down and which point my girlfriend&apos;s dad who is in his 50s jumped up and racked out 12 with ease. He didn&apos;t even twitch. I think he stopped at twelve in order not to embarrass me (which I appreciated). He could have done a bunch more. This was the moment when I realized I was not doing anything right. My months of erratic workouts and occasional periods of eating right hadn&apos;t gotten me anywhere and I needed to get it in gear. I didn&apos;t know exactly what I needed to do but knew that I needed to do something and be committed to it. This humbling experience seemed to be just what I needed to really hit it hard and get it done. I Knew That I Needed To Do Something And Be Committed To It. The state fair had been in September 2009. So when I got home I started hitting up the gym everyday and working until I couldn&apos;t move. I did this for about a month. There weren&apos;t any real nutritional changes in my diet at this point because I didn&apos;t know yet how important it was. After about a month of getting nowhere I went online to buy some protein powder hoping that would help. 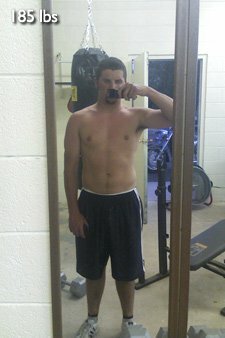 This was a huge changing point for me because I stumbled upon BodyBuilding.com. I found some protein that looked good and read some reviews. I spent more time looking at products then found all the articles about different goals and I was hooked. I bought the basic supplements I learned I needed and got to it. I made it a goal to read one article a day while I ate lunch. It seemed that the more I learned and tried things the better results I got. After lots of reading, I found out that in order look like I wanted I needed to shed some fat and then build some lean muscle. I weighed about 184 pound at this point. I started following advice with my eating and exercise and the pounds fell off and I loved seeing the changes each week. I shed a lot of fat and sadly some muscle too. 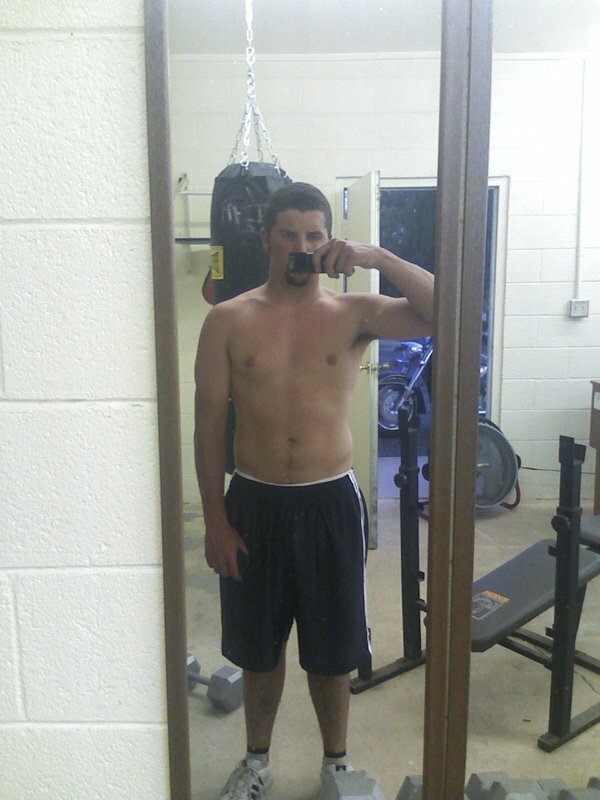 I ended up at 152 pounds at the start of 2010. This is when I started to eat a lot of really clean foods and gain some good muscle. I loved going to the gym and having increase after increase in the weight I could lift. Over the course of spring I gained in muscle and just a little fat. I was really feeling good about myself for once and loving it. I reached a new weight of 170 pounds only this time my body looked nothing like what it used to. After another little cutting round I was now at about 162 pounds and 7% body fat. I am still on my way to getting bigger and staying lean and am now at 175 lbs and 7.5%. It has now been almost exactly one year since I started wanting to change myself. I had started on my 22nd birthday in May of last year and am going to feel and look so much better this year on my birthday. It&apos;s like I am a whole new me. I have never been so happy with myself in my whole life. The More I Learned And Tried Things The Better Results I Got. My diet was pretty simple. I shot for at least a gram of protein per pound body weight. When I was trying to lose fat I would cut my carbs back until I was below my daily calorie limit (2000 Cal). When I was trying to gain muscle I shot for closer to 3500 Cal per day. I always eat six meals per day. When I was losing weight I ate about the same things but smaller portions and vice versa when I was gaining muscle I ate more but that was a pretty good baseline. I lift to 4-5 days per week and always take the weekends off. When I was cutting I would do cardio for 45 minutes 6 days per week. When I am gaining I cut it down to 3 times per week and only about 25 minutes. You have got to want it. Set goals that you can measure like body fat or waist size and keep on track. They progress you see will just help you do even better. Once you start to see progress it&apos;s great to keep going. I am not even close to "finished." I have even more goals now and just want to get better. If someone decides they really want to change there is no reason to do it half way, commit to it and do everything you can to make your goals real. I am convinced that education is the best way to know what do to. Read everything you can and talk to people who are where you would like to be but be sure to take it all with a grain of salt because chances are not everyone will agree. But if you find out everything you can they you can make an educated decision for yourself. Pick it and stick with it.